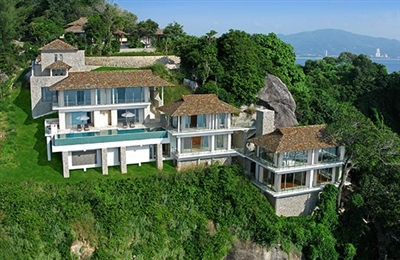 We've seen some villas in our time, but Baan Paa Talee Estate took our breath away. The quality and scale of the villa; the wild beauty of its surroundings; the vast ocean panoramas from almost every room; the warm welcome from the exceptional staff and the creativity of the villa's skilled chef are all in a class of their own. We were particularly happy to learn all about the villa and the surrounding area from the villa’s knowledgeable, guest-relations manager, who made our stay even more special. Although Baan Paa Talee is spread across four levels of accommodation, we found ourselves drawn to two special spots: the reception lounge on the 'top deck' - so beautiful at sunset – was the obvious choice for evening cocktails before moving into the glass-enshrined dining room for another memorable dinner; and the whole pool area, which worked brilliantly with its options for lazing, swimming, soaking in the jacuzzi, enjoying a game of pool in the bar area, or cooling off in the media room with a favourite movie. The bedrooms are really well arranged, offering total privacy if you want it (especially in the Ocean Villa), or flexibility for families in adjoining suites. All are beautifully fitted and furnished and very comfortable. Our stay was perfect and we can only hope we get a chance to return. Perched at the windswept edge of a lush Kamala promontory, Villa Minh is an enthralling escape. First, the views. 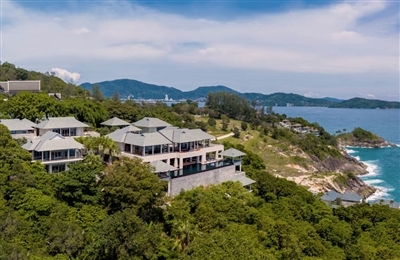 Not only were we treated with a breathtaking panorama of blazing sunsets over the sea, but also of the crags and jungle-clad hills of the headland, most impressively from the lower-level master suite that offers a dreamy view of a palm-tree studded outcrop surrounded by the swirling emerald sea. During our stay the skilled and friendly staff certainly freed us from any worry or discomfort, and Minh’s exceptionally elegant design provides plenty of inspiration. This would be a special place to get married, and we were told that a wedding with 40 guests was to be staged here soon. The marble-tiled infinity pool makes for an indulgent dip. We discovered why the villa manager referred to it as the “bling pool” when purple and white lights began twinkling from its depths after dark! A lot of thought went into the art collection here, which is an interesting mix of bright contemporary paintings and Asian antiques. Certificate books on the living room’s coffee table provide insight into the age and origin of each of the antiques. Here we must praise the Minh team for ensuring that every sense is enlivened, most obviously with the sights, but even the olfactory experience has been well thought out. Every room has its own aromatic incense and we can declare that Minh has the best smelling bedlinens we’ve ever encountered. Really, we just wanted to bury our heads in those pillows and never get out of bed! We’re still miffed that we forgot to ask the cleaning staff about their scintillating scent secrets.